Adopting change requires a lot of effort and it requires people to take risks. Successful change efforts start by taking this head on, by creating a shared need for change. 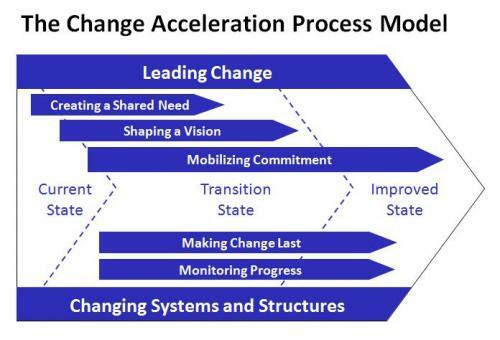 During my corporate career, the model I used for implementing change was the GE change model CAP (Change Acceleration Process). The first three stages of this model are about winning the hearts and minds of stakeholders. – Creating a Shared Need: this stage is about creating a common understanding of why the change is necessary, and stronger than that creating a shared need for the change to be delivered. Without a shared need actual or perceived resistance will result. 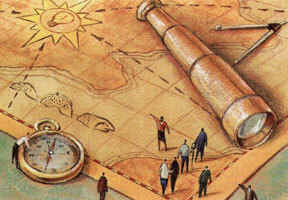 – Shaping a Vision is about creating a picture of the end-game in behavioural terms. This vision needs to be clear, legitimate and widely understood. – Mobilising Commitment is a real test of the leader’s ability to bring the team with him/ her. People will need to make an investment in any change process and mobilising commitment is about bringing people to a stage where they believe the investment is worth making. It is my assertion the the Emotionally Intelligent leader will be more effective in winning the hearts and minds of their followers and stakeholders. Whilst IQ is important, in this instance I believe EQ is even more important as a successful change effort is not necessarily about having the best idea, but being able to bring people on board with the change. Emotional Intelligence (EQ) was defined by Mayer &; Salovey as ‘the ability to perceive, understand, manage and use emotions to facilitate thinking’. Whilst Goleman popularised the term, Emotional Intelligence has appeared in reseach papers as far back as the 1920’s, and it has been widely recognised that there are factors involved in driving managerial performance other than simply IQ. One measure of Emotional Intelligence is EQi. At a global level it includes factors such as: intrapersonal, interpersonal, adaptability and stress management skills. Each of these categories are broken down further and can be seen in this link (Overview of EQi factors). So how does Emotional Intelligence relate to implementing change? Firstly, intrapersonal skills will enable a leader to be strong, independent and confident in their actions. You can imagine how this would help in creating the shared need, and communicating the vision. Interpersonal skills will allow the leader to empathise with his team and take their considerations on board where possible. 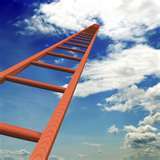 By considering others, the leader will have a better chance of gaining buy-in and mobilising commitment from the team. The interpersonal skills category in the EQi tool also includes a factor described as social responsibility which enables the leader to act in accordance with his conscience. We have all seen the consequences of leaders not acting in a socially responsible manner in recent years. For me, this is where the two models complement each other very well. Not only will an emotionally intelligent leader implement organisational change successfully from the company’s perspective, they will also do it in a socially responsible manner. Lastly, stress management skills have become increasingly important in recent times with some companies seeing the importance of developing resilience within their people. Implementing change is not for the faint-hearted and stress management skills would certainly be an asset for anyone leading change. The super thing about EQ is that it can be developed. I read an article recently on how EQ was successfully developed to tackle bullying by bringing babies into the classroom (Fighting Bullying with Babies). Whilst I am not suggesting that babies should be brought into the workplace, it is an example of how EQ has been developed successfully. As a coach, I use the EQi tool to support leadership development. This is an area of particular interest to me and I would welcome contact from anyone wishing to discuss this further. Nice post – Please connect and we can have more discussions on this topic. Hopefully this relationship will be more understood by people, and in so doing, change can be processed better.